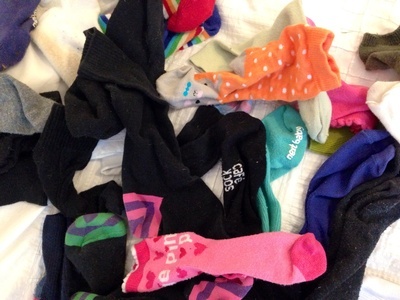 I have a drawer where I keep odd socks, hoping that their matching partner will turn up. There are far too many now but it seems a shame to throw them all out. 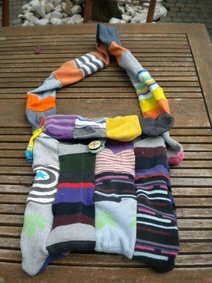 What fun thing could we make from odd socks? Please share your ideas in the comments forum. Bandage Protector: This is what I used for my kids when they had hand injuries. Cut a small hole in the heel for a thumb, cut the foot piece down to size to keep the bandage clean. Duster/Polisher: Two socks for this - pop on your hand and get to work. I use this for the multitude of odd socks I have about the place. I love to use them restoring vintage/antique sewing machines. Baby booties: Use these as mittens to shop babies scratching their faces. Mini Christmas Stockings: attach a small paper/cardboard Xmas motif to the outside with a small safety pin. Dolly/Teddy Hats/Headbands: Lay ght across from the heel to the top foot part. Tie near where you've cut, winding cotton round tightly to close the top of the hat. Use the ribbed tops for headbands/ belts. Shoe Protectors: Who ever they fit then they can use them to put their shoes inside them when they travel, stops scuffs and any dirt getting onto other things! Arm warmers and sock monkeys! First answer has to be...sock puppets! Sew eyes and a mouth, or glue felt shapes if you don't want to sew. Then have some sock puppet theatre. Baby dragons. You just need some hair ties and paper and then you're good to go. One of my friends who is now recovering from cancer adopted a saying, "Sock it to cancer!" All of her friends were encouraged to wear odd socks. As a fund raiser, she is now selling pairs of odd socks that go nicely together. So why not choose a pair that co-ordinate with the rest of your outfit for casual occasions. It will trigger the curiosity of your friends and be a chat starter. What a great idea! Love the bag. P.s. We're always looking for great new writers for the site - if you'd be keen to write up a project tutorial sometime we'd love to see it.